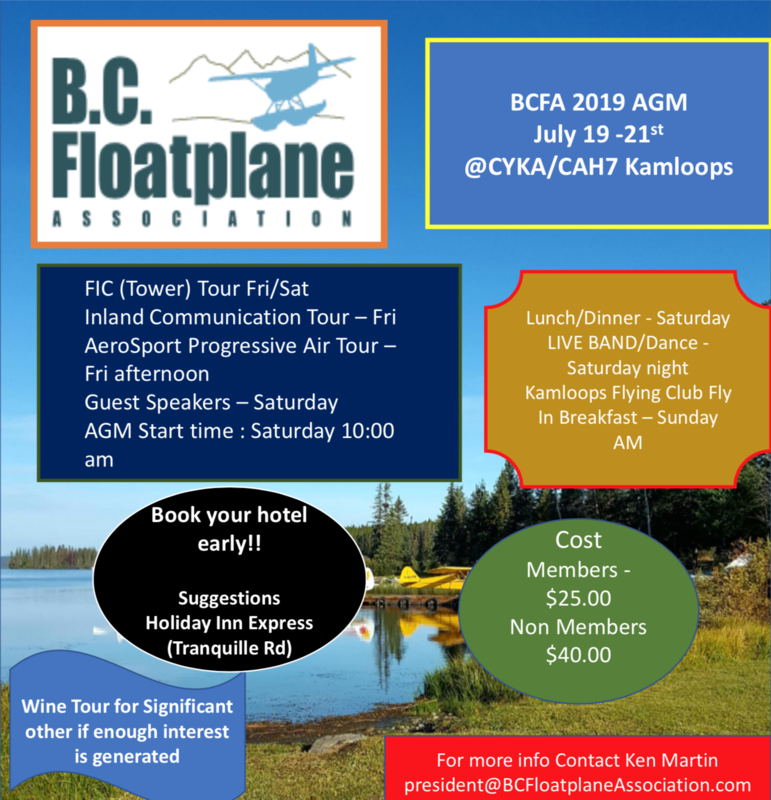 The BCFA is now accepting applications for the 2019 Freedom to Fly Floats in BC Scholarship. Deadline for submitting applications is May 1, 2019. The BCFA awarded two scholarships in 2018. See the link below for application details and read about our current and past winners. Well we tried, but in 2018 the weather was poor for the September 8-9 weekend, so the event was cancelled. We will reschedule and try again. The weekend following the 8-9 had poor weather again, so it's likely this won't get rescheduled until 2019. The BC Floatplane Association recognizes the need to continue our freedom to fly floats in BC. 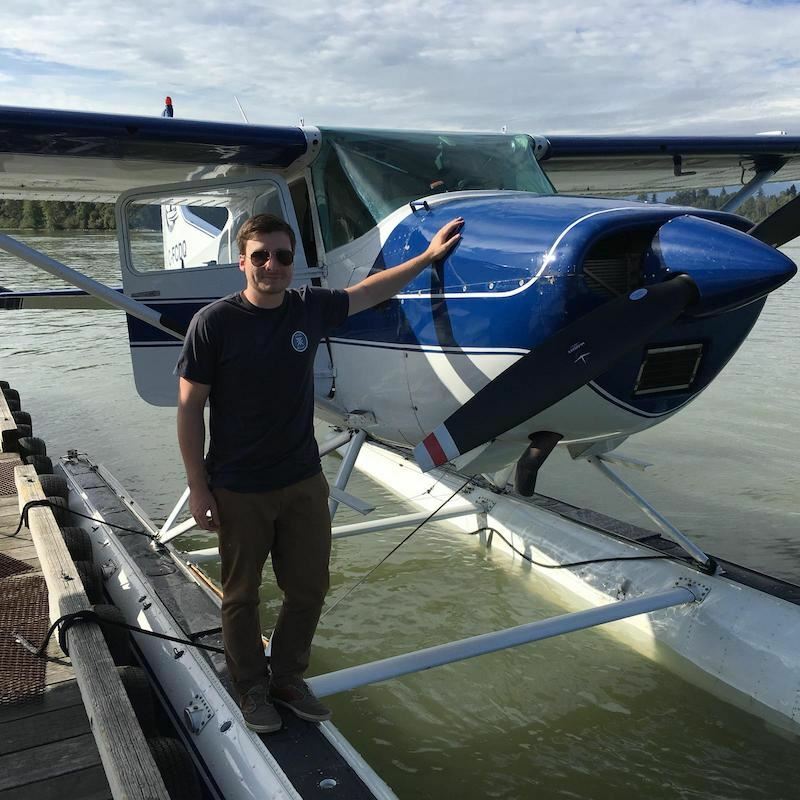 The BCFA awarded two $2500.00 scholarships towards a seaplane rating in 2018 to Sylvain Leone and Skylar Pridham. One of the scholarship winners, Sylvain Leone accepting his award at the 2018 AGM in Timothy Lake, BC. Left to right: Wendy Boyes (scholarship chair), Sylvain Leone (2018 winner), Fanny Leroy (2017 past winner). 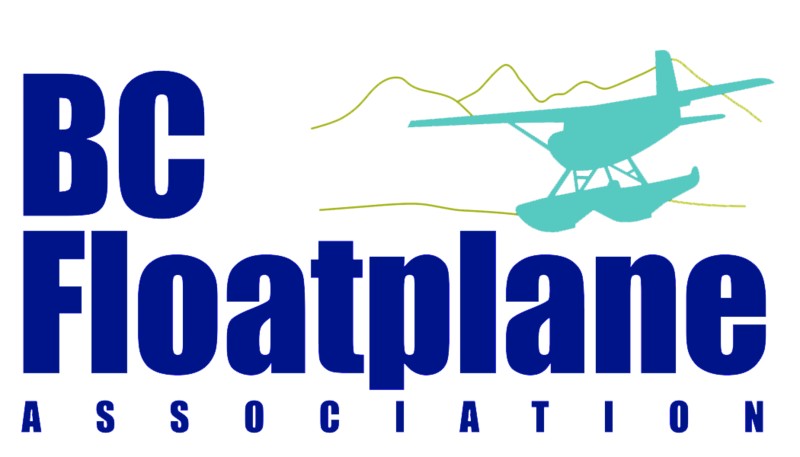 Washington Seaplane Association (WSPA) and BCFA have a goal to increase interaction amongst members. Notwithstanding the border between us we share all of the same challenges and opportunities. We will be kicking this effort off with a splash out in September to Phantom Lake, BC. Phantom is approx. 15nm NW of Squamish. Phantom Lake (3100’ msl and 10,000 feet long) is a popular destination for floatplanes. There is a convenient sandy beach with nearby primitive camping. BCFA seasonally positions a canoe at the camp site. Nearby float accessible lakes include East Falk Lake and Kato Lake. These latter lakes, being higher and shorter, are a bit more challenging and suitable for higher performance aircraft. There is excellent hiking and scrambling at all of these lakes. The 2017 BC Floatplane AGM was at the Wilderness Rim Resort, Nimpo Lake, Sept 15/16/17. Most folks flew or drove in on Friday. We had a potluck dinner on Friday evening and Mary & Tabby fed us for the rest of the weekend. The AGM was Saturday afternoon, which allowed some of the group time to fly in the morning, fuel up, and just generally catch up with friends. There were 20 attending the meeting, not to bad considering the short notice, forest fires and uncertain weather. The weather was very good for flying on Friday and Saturday, but a system moving in on Sunday kept everyone alert for the flight home. The forecast models were correct and the rain did not hit Vancouver until early afternoon. Using the official scoring guide the packages were reviewed and scored by the scholarship committee which was made up of four directors. The scores reflected the well-deserved successful winner as Fanny Leroy. Fanny obtained her Private Pilot Licence in Quebec City. 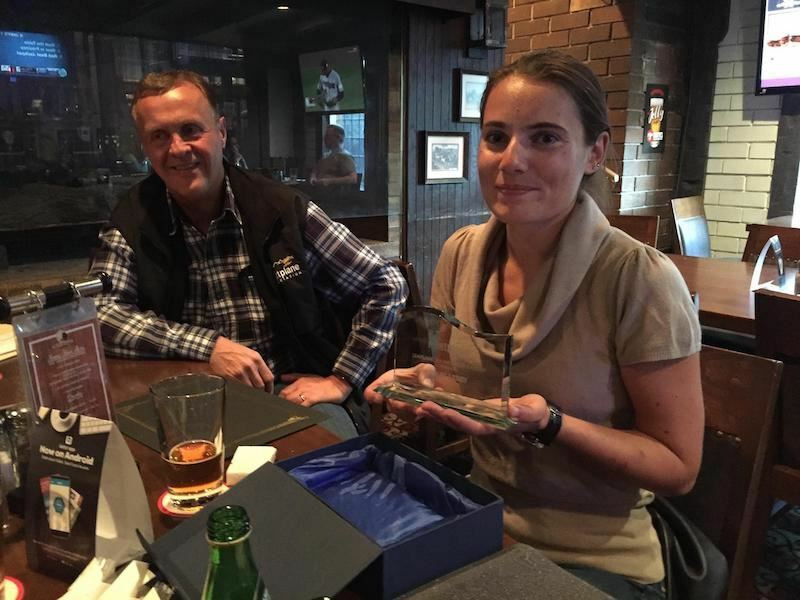 She has currently completed the requirements for her Commercial Pilots Licence in Pitt Meadows. She was the successful candidate for a flying program on emergency maneuver and unusual attitudes through the Ninety-Nines and has taken her training in Squamish. Fanny was also granted the 1,000.Mary Swain memorial scholarship awarded by the BCAC and is an active member of the Nintey-Nines and the BC Mountaineering Club. Fanny was awarded our scholarship monetary award of 2,000.00 last month and has already successfully completed it with Fort Langley Air. I am happy to say this outdoor love of life girl has now changed her goals from putting her energy and money into IFR training, to obtaining advanced float flying training. She is ever so grateful to the BCFA for giving her this chance of finding where her love is in this world of aviation and will be furthering her flying goals in this area. There is no doubt in my mind Fanny will continue to succeed in her goal of flying floats and will help keep the future of the freedom to Fly Floats in BC alive. The BCFA could not have awarded this scholarship to a more deserving pilot. Congratulations Fanny from the BCFA board and members. Fanny is sorry she was unable to make this year’s AGM but says she will see you all next year. Fanny is currently working full time for an aviation business and performing bookkeeping contracts part time to further her float flying goals. If you know of anyone who needs a bookkeeper for small contracts jobs please give her a call. 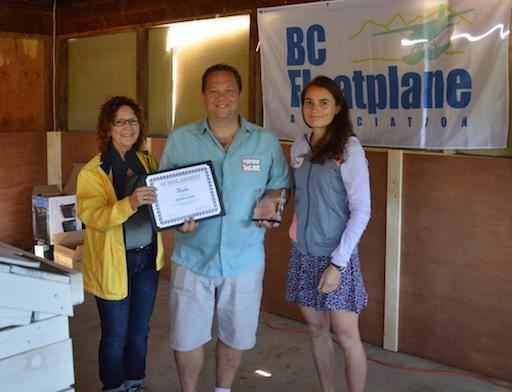 The BCFA directors are pleased to announce that Dominic Beaumont, last years 2016 "Freedom to Fly Floats in BC" winner, has successfully completed his rating last September with Fort Langley Air. In his own words he stated, "I feel so fortunate to have been given this opportunity by the BC Float Plane Association." He helped out at the AGM and he has indicated his ongoing commitment to our association. He is currently working on his IFR and is planning on flying floats for a living. Congratulations Dominic and welcome to the world of float flying.